Patients requiring treatment for sports injuries and joint replacements in Lincolnshire will be able to receive care from a new consultant at Grantham and District hospital. 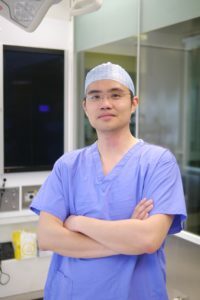 Mr Paul Lee has joined United Lincolnshire Hospitals NHS Trust as an orthopaedic consultant. His clinical interests are lower limb reconstruction or replacement, regenerative and sports surgery and non-surgical treatment of arthritis. He has completed the highly competitive and prestigious Exeter hip fellowship training and published on the tendon sparing approach for hip replacements. His passion for regenerative medicine has led to his interest in stem cells and the unloader brace, a non-surgical option for osteoarthritis. He has successfully treated UK Premiership footballers for muscle injuries which significantly reduced their time for recovery and return to play. Having been with the Trust for only six weeks, Mr Lee has already set up the Grantham Trauma Society for both staff and members of the public and developed a programme of teaching and public lectures. These include management of knee pain, injection therapy and hip fractures. The aim of Grantham Trauma Society is to promote awareness and education for emergency care on fractures, tendons and muscle injuries. ·Mr Lee is a certified Member of the Facility of Sports and Exercise Medicine (UK) and also achieved the certified fellowship exams in Europe (FEBOT) and UK (FRCS) in orthopaedics. ·He is a double board certified orthopaedic and sports medicine surgeon with a PhD in medical engineering, and MSc in injection therapy. ·He has successfully applied his research to clinical use, with over 40 clinical publications.